On Dec. 3, Colonel Peter J. Benson from Fort Bragg joined BCBSNC and UNC School of Medicine to reveal a new collaboration for veterans that will address the health care professional shortage in N.C.
BCBSNC and the UNC School of Medicine are collaborating to create a physician assistant master’s degree program for veteran medics with input from the United States Army Special Operations Command. The program aims to enroll its first class of students in 2015, and will build on the extensive medical training Special Forces Medical Sergeants receive during their service. Almost 1 million North Carolinians live in areas with a shortage of health care professionals. The two-year program will provide opportunities for military veterans to practice medicine in North Carolina, helping communities facing these shortages. 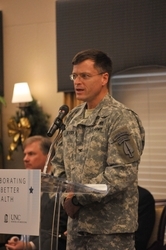 CHAPEL HILL, N.C. – Blue Cross and Blue Shield of North Carolina (BCBSNC) and the UNC School of Medicine (UNC) are collaborating to create a physician assistant (PA) master’s degree program designed for returning military veterans with input from the United States Army Special Operations Command team at Fort Bragg, N.C. The program will build on the medical experience and training that Special Forces Medical Sergeants receive during their service and provide opportunities for veterans who want to transfer their unique and hard-earned skills into the health care system. This collaborative effort will improve health care access for North Carolinians by reducing the shortage of health care professionals in our state. BCBSNC has pledged $1.2 million over the next four years to help UNC establish the master’s curriculum and hire full-time program staff. A significant portion of the grant will provide scholarship funds through the Medical Foundation of North Carolina to assist Special Forces Medical Sergeants who have transitioned out of the military. The United States and North Carolina are facing a deepening shortage of doctors and primary care physicians. Some figures estimate that by 2020, there will be a national shortage of about 150,000 physicians and 65,000 primary care physicians[i]. And in North Carolina, almost 1 million people live in areas that do not have enough health care professionals to effectively serve their communities[ii]. UNC will create a two-year curriculum with training rotations at UNC Hospitals and free clinics around the state. The program’s training will focus on primary care to meet the needs of underserved communities in North Carolina. Research has indicated there will be high interest and participation in the program. A 2010 national survey of Special Forces Medical Sergeants revealed that nine out of ten respondents wanted to pursue a career in health care outside of a military setting, and about half were interested in becoming PAs[iii]. Since 2009, the UNC School of Medicine and the Joint Special Operations Medical Training Center (JSOMTC) at Fort Bragg have collaborated to enhance medical training, care and innovation in underserved areas of North Carolina. Their existing collaboration will influence the development of the new master’s degree program with an executive advisory board seeking input from JSOMTC. "I'm extremely proud that the University of North Carolina at Chapel Hill is part of this initiative,” said Chancellor Holden Thorp, University of North Carolina at Chapel Hill. “It's one more example of how our campus has worked with the United States Armed Forces since World War I to train our soldiers and to help the people of North Carolina." The UNC Master’s of Physician Assistant Studies degree program, pending review and approval by the UNC Board of Governors, is in the early planning stages and plans to enroll its first class of student veterans in 2015. Blue Cross and Blue Shield of North Carolina is a leader in delivering innovative health care products, services and information to more than 3.6 million members, including approximately 900,000 served on behalf of other Blue Plans. For 78 years, the company has served its customers by offering health insurance at a competitive price and has served the people of North Carolina through support of community organizations, programs and events that promote good health. Blue Cross and Blue Shield of North Carolina is an independent licensee of the Blue Cross and Blue Shield Association. Access BCBSNC online at bcbsnc.com. ® Marks of the Blue Cross and Blue Shield Association. All other marks are the property of their respective owners. The University of North Carolina School of Medicine is a nationally-ranked public medical school with campuses in Chapel Hill, Asheville, and Charlotte. The UNC School of Medicine is home to more than 1,500 students in various degree programs including those offered in the outstanding department of Allied Health Sciences, PhD programs in the biomedical sciences, and the MD program. Students may earn combined degrees, including the MD-PhD, MD-MPH, and MD-MBA degrees, in cooperation with the Gillings School of Public Health and the Kenan-Flagler School of Business, respectively, at UNC. Medical education began at UNC-Chapel Hill in 1879. A four-year MD-granting School of Medicine was established in 1952, in conjunction with the opening of the N.C. Memorial Hospital. The UNC School of Medicine is in the top tier of peer institutions for graduating students who practice medicine in underserved areas as well as bringing in federal grants and contracts, including NIH funding. The School is one of the few in the nation to excel at both teaching primary care skills and the fostering of research careers.